Being in the great outdoors is a fantastic experience. I was lucky enough to have the joy of camping instilled in me at an early age. Before I was born, my parents were keen outdoor enthusiasts and as soon as I was old enough, I joined them on their trips. Passing on this feeling of freedom and escape to children is priceless—and healthy for both body and mind. The problem is, choosing the right camper trailer to enjoy that pleasure can be tough. This is particularly relevant if you have a large family. Naturally, there are both campers and RVs that can accommodate bigger families. But often this means a trailer that is excessively large and expensive. Having bunk beds can be a godsend. They can alleviate some of the issues associated with large family camping while providing useful and enjoyable benefits. However, with the mass of travel trailers on the market, together with hundreds of differing floor plans, picking one is no small feat. Well, we have made it easy for you. This article brings you the four best camper trailers with bunk beds currently available. What’s more, we will look at what makes these units ideal for family camping, especially for the kids. Thereby providing a love of outdoor living that your children will carry for the rest of their lives. 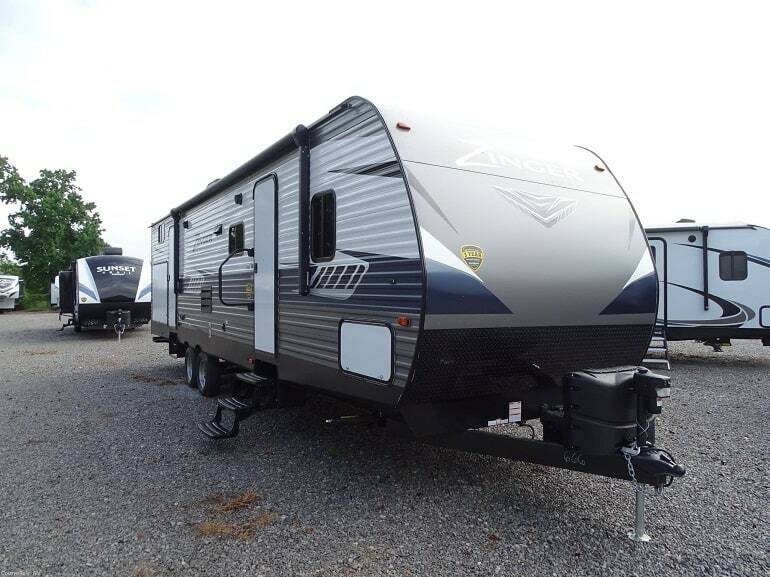 When it comes to size and versatility, this is one camper that takes it to the max. Starting off with the bunk-bed capacity, which is large. In total this particular model has two pairs, plus one single overhead bunk. This makes it appealing for the larger family. These bunks are also in their own bunkhouse, located at the rear of the trailer—you can close the door on the children if they become too loud. Or hide in there yourself! This area is also good for those kids who want their own sitting space, as the single bunk is located above a large sofa. This leaves you the entirety of the living room. The spacious 81-inch ceiling height means that while sitting on the top bunk, heads are not going to be injured. If your children like futuristic appeal, the interior fascias are accented in LED strip lights, giving it a space-age feel. Mom and Dad have their own space too, with a bedroom housing a queen-sized bed. This includes two closets, a TV hook-up facility, and twin bedside nightstands. Storage space is generous, with high and low level cupboards, together with trunks below the seating. All audio entertainment is through a single high level, remote-controlled center. A 39-inch LCD TV is also an optional extra. While this model can accommodate up to 10 people, there are smaller versions available (down to six people). In total there are 33 floorplan options to choose from. Separate sleeping area for bunk beds, which includes a sofa. Capacity for five people to use the bunk beds. Bedroom area for mom and dad. Lacks a closet in the bunkhouse, although there is space for one to be added. When it’s raining outside and you’re confined indoors for a few hours, you don’t have to worry about entertaining the children in this camper. The bunkhouse includes a TV cabinet purely for their use, keeping them amused. Or distracting them for a while, for example, when preparing dinner. This cabinet is floor to ceiling, allowing for the ample storage of clothing if required. There’s plenty of sleeping space for them, too. You might even be able to bring along their friends. The 2 bunk beds allow a four-person capacity. This bunkhouse is entered through a folding blind, not a door. This may appeal to parents who have children likely to barricade themselves in. When the sun comes out, you can venture outside with the family and enjoy the camper’s extras. The outside kitchen, which includes a refrigerator, sink, and double-burner, means alfresco dining is on the cards. If the sun becomes too hot, shelter can be sought from the 18-foot awning, keeping the harmful UV rays at bay. I would suggest that this is a handy accessory for those with younger children—childhood UV exposure has been shown to cause issues in later life. While the children are entertaining themselves in the bunkhouse, mom and dad can relax in front of their own entertainment system in the living room. That being said, vacations are for family time. So, a slide-out feature provides a spacious living area together with ample seating for all. If you have younger children who need assistance with bathing, the large bathroom and shower tub could be of particular interest. Ablution time becomes both simple and convenient. This model can sleep 8-10 people. There are 15 different floor plans to choose from. U-shaped dining area for family meals. Ample pantry space to feed mom, dad, and the kids. Numerous decor packages are available. No seating area for the children in the bunkhouse. Exterior design may appear a little dated for some tastes. This trailer could be a good option for those people who really want to spend the maximum amount of time outdoors. The 18-foot awning keeps the sun away while you enjoy dining from the outside kitchen. For those who also want to kick back in the evening and enjoy a bit of a party outside with the whole family, it’s a good choice. The camper comes complete with two exterior speakers, which are linked to the entertainment system. You, or your children, will never be away from your favorite tunes. When you do venture inside, the pitfalls of outdoor life have not been forgotten. The entire interior floor of the trailer is covered in linoleum—making it easy to clean. There’s no need to worry about the children squishing their muddy feet into the carpet. Appearance wise, it’s a good-looking trailer. For the more traditional camper who likes the look of the all-American 1940s teardrop, the front of this camper will not disappoint. But, unlike the teardrop, it has loads of space. There are two single bunks, both located at the rear of the camper. Each one is above the mini-dinette and outside kitchen. If your kids want to “play adults”, or they are at that awkward stage where they don’t want to be with mom and dad all the time—they can dine and play alone. A further dining area features in the slide-out area of the living room. This, combined with the mini-dinette, means all campers can eat at a table. No messy foods will be dropped onto the sofas. When you and the family have returned from that awesome hike, covered in mud and with aching muscles, this camper will appeal. Unlike many trailers, which just have a shower, this camper has a three-quarter-sized tub. Perfect to give the muscles some TLC. Storage space is generous, with numerous cupboards, closets, and bench trunks indoors. Outside, there is a pass-thru which could suit those who need to store small bikes, chairs, or hiking equipment. This model sleeps eight people, two in bunks. In the Salem range, there are 11 different floorplan options. Exterior speakers for outside entertaining. The bathroom includes a tub—ideal for bathing or cleaning equipment. Pass-thru allows for the easy storage of large/dirty exterior items. 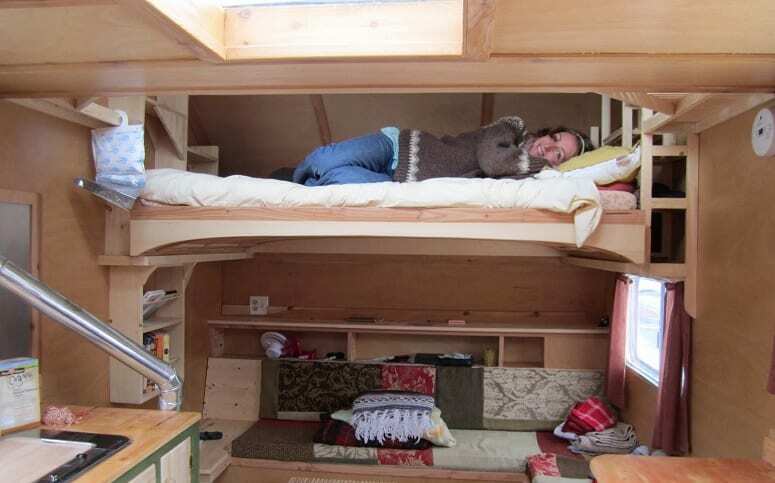 While this sleeper can sleep eight people, four will be in the living room as there are only two bunks. If you want to take bunk bed capacity to the extreme, this could be the perfect choice of camper trailer. The Grey Wolf 26DBH features large double bunks, located in their own private room. Let me be clear, that’s one double bed on top of another double bed (50 inches by 74 inches). That’s a lot of room for the kids to play on. It’s also a great feature to have if you’re holidaying with adult friends. If you have two couples who want to come on holiday with you, they both have a double bed that they can share. No need to be separate. Although, like kids, they will probably argue over who gets the top bunk. An oversized dining area means that all the family, or friends, can gather around one table. There is no need to eat in separate areas or “stagger” meal times. In many ways, this is a home away from home. Beneath the TV mount is a fireplace, covered with a modern mantel—providing a cozy and homely feel. Ideal if you enjoy camping in the colder months. If you’re more of a warm-weather camper, this trailer has some nice outdoor features that will appeal. It includes a motorized awning, kitchen, exterior TV mount, and three outside storage areas. One particular feature that may be attractive, to those who like to get down and dirty in nature, is the outside shower facility. No more sand and mud being brought into the camper. A large slide-out creates a spacious living area. This is another feature that may appeal to those holidaying with adult friends where space is important. Inside the camper, attractive decor and LED highlights make the interior look modern and appealing. Unfortunately, the exterior is less appealing. Muted colors, together with 1980s-style flashing, make it look older than its years. This may not suit those who like their campers to “shout” a little. This model sleeps up to 10 people. There are 13 other floor plans available. Exterior shower and TV mount. USB charging ports at bedside, table, and bunks. The outside appearance looks dated. 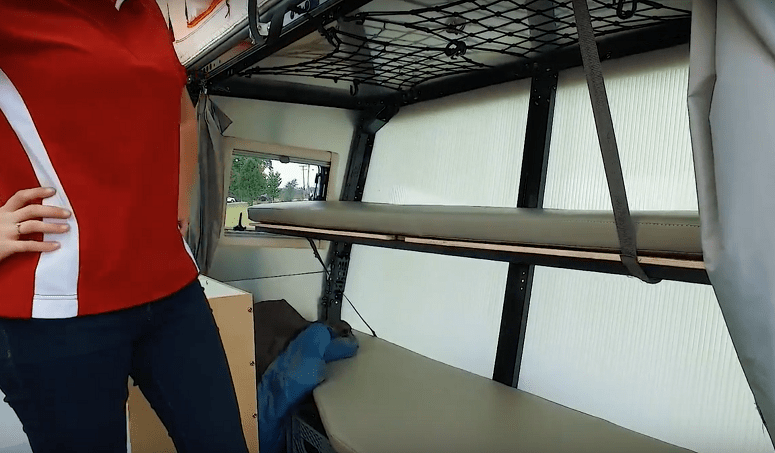 Why Should I Choose A Camper Trailer With Bunk Beds? With the seemingly ever-growing size of camper trailers, you might conclude that there’s a camper out there that can accommodate everyone without bunk beds. Unless you are Rehoboam, that is, who had 28 sons and 60 daughters. While this may be true, there are some distinct advantages to having bunk beds in your camper. I will never forget the first time I had the chance to sleep in a bunk bed. The excitement and the discussions over who got the top bunk were always invigorating. Bunk beds provide an added novelty for the children on top of the enjoyment they are receiving from the camping experience. Don’t be surprised if you’re keen to get busy on a walking trail but they just want to play on the top bed. At times when you need to be in the camper, for example when there’s torrential rain outside, bunk beds can be a fun distraction. There are many factors that affect the price of the camper trailer, but one of them is, undoubtedly, size. Bunk beds, by their vertical design, cover less square footage than “normal” beds. Hence a travel trailer with bunk beds allows a better berth-to-price ratio than those without. What’s more, less space taken up by beds means more living space for all the family. When your children reach a certain age, no doubt they will want to bring their “bestie” with them on the trip. Even if you don’t need the capacity all the time, bunk beds give you a cost-effective way of having extra beds available for any additional campers. Naturally, that doesn’t just apply to your children. When your neighbors have seen your camping photos on Instagram, they might be begging to join your next trip, too. As mentioned earlier, there will undoubtedly be a debate about who gets the top bunk on the first night. But after that, bunk beds could remove many nighttime arguments. If your kids usually sleep apart but are bundled together in one large bed or side-by-side in sleeping bags while you’re in your camper, it’s a perfect storm for problems. Been there too many times, right? Bunk beds can, to some extent, make these occurrences a thing of the past and provide a quiet night. Sometimes, the adults need a little, well, evening “private-time,” which has been shown to increase relationship well-being. Some of the larger camper trailers come with bunkhouses, separate rooms that house the bunk beds. This increases the privacy level so the adults can relax. It’s not just about the beds for the kids, although that’s important. Choosing the right camper trailer means ensuring that it can meet the demands of the entire family unit. Here are just a few things that are worth your consideration. There are some factors to take into account with the beds themselves, not just the sleeping capacity. Consider whether you want them close to your sleeping area or further away. Closer means it’s easier to check on them, further away provides mom and dad with more privacy. Typically, the double bedroom is located at the front of the trailer, with the bunk beds to the rear. This may not be ideal if you have really young children. It’s also worth considering the style of the bunk beds. Are they single or double? Getting younger children to sleep together may not be an issue. But the older they get, the less likely they are to be happy sharing one mattress. When choosing a camper van, with bunk beds or not, always assume the worst possible camping circumstances. The weather forecast may have been great before you left home, but sometimes you’re going to be caught in a downpour at your campsite. The more space that the trailer has, the more comfortable you and your family will be when confined to the camper. Children with little space to play in can become frustrated. Moms and dads too. 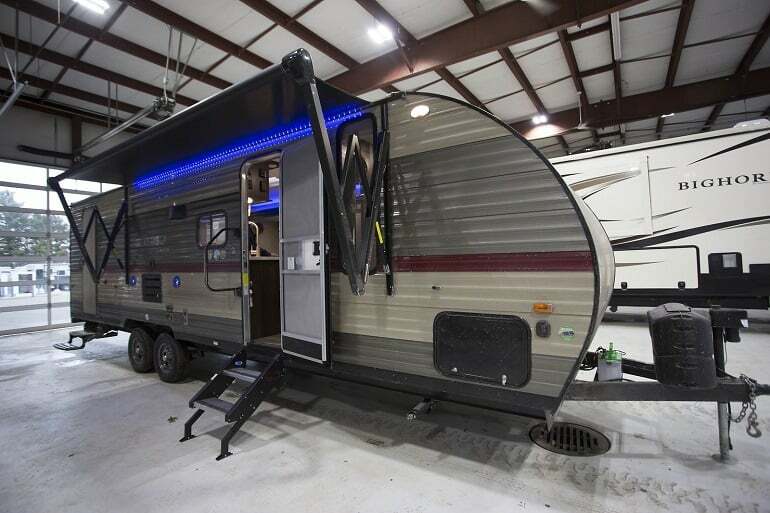 Campers with a slide-out facility offer the largest capacity. It’s not just about being trapped in the trailer due to inclement weather. Often, evenings are the time you get to enjoy the trailer itself. For the whole family, an entertainment center is a must. Consider if there are hook-ups or mounts for televisions throughout the camper. Additionally, if you like the evenings outdoors, an outdoor entertainment center, speakers, or even a TV could be of benefit. 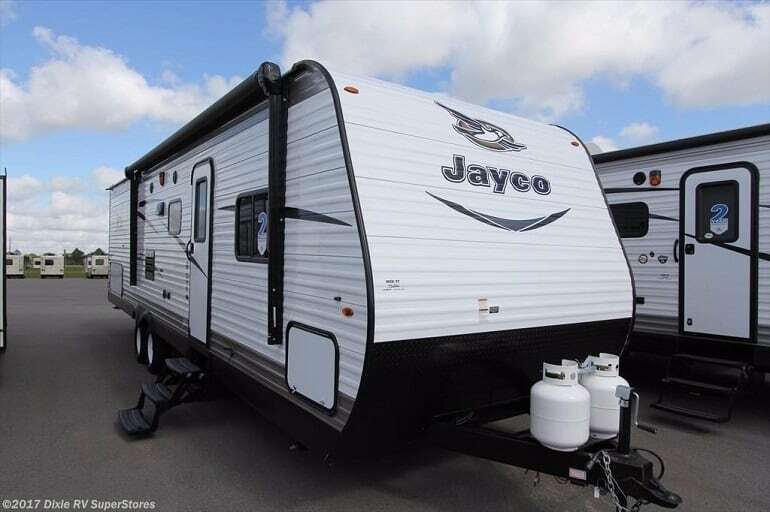 We’ve listed above specific models of campers and trailers. Most manufacturers offer a variation on a theme. 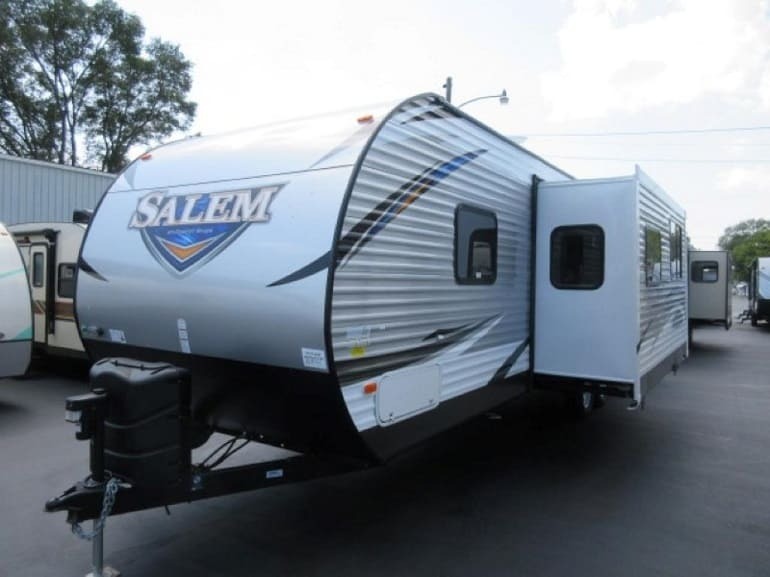 It’s worth looking for a trailer that has numerous floor plans available. That way you can choose one that suits your tastes and requirements the best. I hope that this article has given you some hopeful pointers in choosing the best camper trailers with bunk beds. The four I selected are the ones that I consider to be the best available today. This makes them the ideal homes for you and your family’s continuing outdoor adventures.